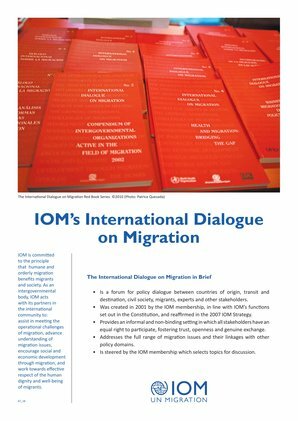 The workshop on "Managing Return Migration" was held in the framework of IOM’s International Dialogue on Migration (IDM) which in 2008 has an overall theme of "Return Migration: Challenges and Opportunities". Return migration has progressively been attracting the attention of policy-makers and other stakeholders involved in migration issues both as migration trends move toward more temporary patterns and as governmental policy interest increasingly focuses on the need to ensure the protection of rights and dignity of individuals. However, return is rarely approached in a holistic manner or analysed in the broader context of migration management. Moreover, perspectives on return and even its definition differ from country to country, often depending on their migration histories. There is a need to explore the issue of return from a more comprehensive perspective, including in terms of its role in contemporary migration dynamics, patterns and policy; the reasons for and impediments to return; different circumstances under which return migration occurs and its diverse forms; the human rights of migrants; and the policy and programmatic actions stakeholders can take to facilitate safe dignified return migration, particularly in the context of a collaborative effort. To bring together governments and other relevant stakeholders to share experiences pertaining to return migration and to stimulate discussion on existing practices, highlighting the diverse and yet complementary management perspectives of countries of origin, transit and destination with a view to reconcile and balance the diverse interests and concerns of all migration stakeholders as well as to enhance cooperative migration management approaches. To bring forward and highlight key issues that would form part of comprehensive return migration approaches as well as to address the relationship between migration and other policy domains such as development, trade, human rights and health. To provide the IOM membership with the opportunity to discuss return migration management in depth and to identify effective means for and successful approaches to managing return in a safe, dignified and sustainable manner. 14:00 - 15:00 Side-event: "Strengthening Reception Capacity for Boat Arrivals: Cases of Lampedusa/Sicily"
At the request of and in collaboration with the Government of Italy, IOM, the United Nations High Commissioner for Refugees (UNHCR) and the Italian Red Cross (CRI) have worked together to support Italy in responding to the arrivals of large numbers of irregular migrants to the island of Lampedusa and other locations in Sicily. Among other activities, these agencies assist in providing information and counselling to the migrants and conducting pre-screening with respect to various categories of migrants (economic migrants, asylum seekers, victims of trafficking, unaccompanied minors, etc.) in order to identify persons in need of special assistance and to ensure they are referred for appropriate procedures or structures which address their specific needs. Drawing on this experience, representatives of the Government of Italy, the Italian Red Cross, UNHCR and IOM will highlight the merits and challenges of collaborative efforts to address the complex migration management issues which arise in Lampedusa/Sicily and which may be relevant for other boat arrival contexts.